Canon to replace Dual Pixel AF with Quad Pixel AF? Canon's Dual Pixel Autofocus technology is held in the highest regard among photographers, and is widely considered to be the most reliable AF technology for both stills and video. So it's very exciting to discover that Canon is now developing Quad Pixel Autofocus. Canon News has uncovered a patent application indicating that the manufacturer has split each pixel into four segments. According to the site, the sensor described in the filing is a 20.7MP sensor with a staggering 83 million focus detection points! "Therefore, there is the object of this invention in providing the image sensor which can always perform focus detection by an image surface phase difference system with high precision, and the imaging device using this image sensor. "In order to achieve the above-mentioned object, the image sensor by the present invention, A plurality of optical waveguides which a unit pixel part provided with a plurality of pixels is the image sensor arranged by two-dimensional matrix form, and draw light to said plurality of pixels, respectively, It has the segregant formed among said plurality of waveguides, the height and position of the aforementioned segregant are changed according to image height, and the pupil distance of said plurality of pixels is changed in each of the aforementioned unit pixel part." The key part is that 20.7MP sensor, which has a pixel size of 4 micrometers – equating to a width of 22mm (5575x3725) – equating to an APS-C sensor. Canon News posits that decreasing the pixel density would facilitate a Quad Pixel AF sensor, but the decreased efficiency would necessitate going from 24MP Dual Pixel AF down to 20MP Quad Pixel. 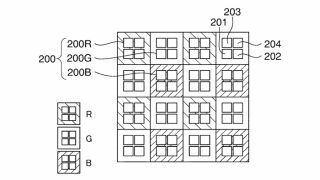 At this stage, then, Quad Pixel AF technology would seem to be limited to lower-megapixel APS-C sensors. Whether it could be further developed for implementation in full-frame sensors with higher resolutions remains to be seen, but it is certainly a very big potential development – and a potential shot in the arm for the EOS M line-up, which have seemed a little lost in the wake of the Canon EOS RP. Dare we even think about an upgrade to Canon's Dual Pixel RAW, and the prospect of doubling the ability to perform microadjustments, bokeh shift and ghosting reduction?